Now we have a good chance of things passing. Make sure you have Travis CI enabled on this repo, then commit and push your code. Once you’ve pushed your change, go to your repo and create a new pull request to start Travis CI. You can see my PR#13 and the corresponding Travis CI build. If we’ve done everything right and we have a bit of luck on our side, we just need to wait a few minutes and everything will go green. Of course, this matrix has 18 tests and we left some future parser test cases in place, so it will take a little while and some of us may run into issues. That’s okay, either fix your code if you can (and it’s trivial – we don’t want the PR to enable Travis CI to turn into a PR with 100 changed files) or disable some of the tests. Don’t worry about the disabled tests, as enabling Travis CI allows us to fix those issues in the future much easier than it would have been in the past. After a few minutes, everything turned out green! Perfect, we can merge the PR! Now we’ve got everything in place to add versions to our matrix and re-enable any checks we disabled. We looked at how to enable Travis CI on a single Puppet module today. 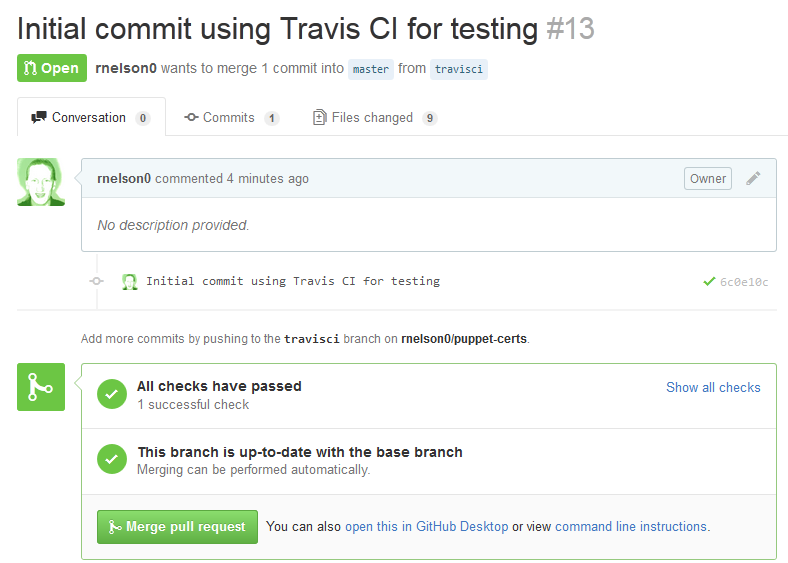 Previously, we enabled Travis CI on our controlrepo. Go ahead and enable Travis CI on any other modules and controlrepos you maintain. This puts you and your teammates in a good position for future development, where testing and continuous integration happens automatically, every time. Start adding tests for Puppet 4 and any other hot newness you want to look at and refactor your code without as much risk of breaking production. Enjoy! Thanks a lot for theses explanations. It’s very useful. I’m trying to do something like this but I’m facing a problem with private repos. I would like to check on travis a private puppet module with private dependencies. but I can’t find how to encrypt the github APIKEY and use it in fixtures.yml file. Do you have any clue for ma ? I have not set up a private module with private dependencies. Have you followed the instructions at https://docs.travis-ci.com/user/encryption-keys/ and https://docs.travis-ci.com/user/private-dependencies/ ? Yes and it leeds to a 404 on github.